Restoring wood furniture takes time and patience, but the results of your labor can be enjoyed for years, even generations. The restoration process usually involves stripping off old finishes, bleaching, staining and then varnishing. Two-Part Hydrogen Peroxide is a strong bleach that will lighten wood and remove previously applied finish stain, providing you with a fresh new surface to refinish. Once you have stripped the old varnish and paint from a piece of furniture (see tutorial on chemically stripping wood), you will most likely encounter stains in the wood surface that should be removed before applying a new finish. Bleaching is a good technique for getting out these stains. However, different types of stains require different bleaching techniques. Choose the tutorial that best addresses your needs. 9. When the furniture piece is thoroughly dry, gently sand it with extra fine grit sandpaper - 280-grit should do the job. 10. Brush off the sanding dust with a clean, dry paintbrush, especially in the joints and detail areas. Then rub a tack cloth over the entire surface to remove all of the dust. To remove stain and marks from wooden floors we are using different types of vanishing and chemical formulas. It is really tough to maintain our wood flooring and to deal with maintenance and repair issues we should take the help of professionals. I would like to pick some of the important points from this article regarding removing stains from wooden floors; thanks for such wonderful tips. Bleaching wood furniture provides an eye-catching look though it is time consuming. It is also a better option to the complete replacement, which helps in saving some pennies. 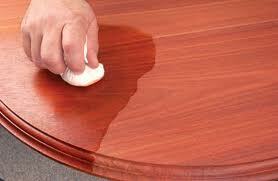 Through bleaching, stains get disappeared from the furniture. However, different kinds of marks need different bleaching methods. The post here contains few techniques, which are worth reading. If we carelessly want to bleach the materials without following any method, then our whole effort will go in vain and also, it may affect our valuable furniture.